So here's the thing about cooking and meal planning. You have to have food. We were without power for 3 days this week, so currently my fridge looks like this. We plan to pick up where we left off next week. 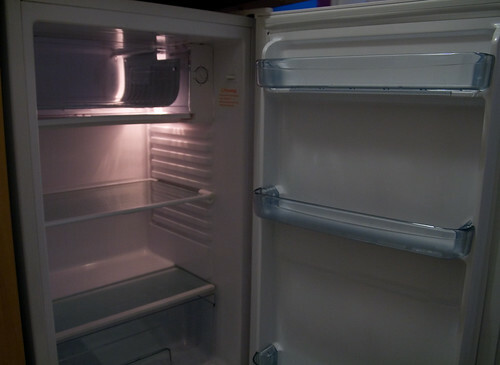 Tell me, if you lost everything in your fridge and freezer what would you miss the most? We lost power as well, but (don't hate me) got it back the same day at night, thankfully. But I think we would miss milk the most since we have a toddler and coffee is just gross without milk. I hope you got your power back! We didn't lose power but we did go from a house to a hotel. I missed not having milk for the kids when they wanted it and deli meats for me. I love my turkey slices. ICE! I need ice for my water. We've been without power for two weeks before. It's not a fun time at all. Glad that you got everything on! New blog follower by the way.